In this article, we’ll be taking a look at the different methods of insulating an attic so you can decide which is right for you. Fiberglass batts have long dominated the insulation industry. This is the cotton candy looking stuff on the big rolls. These rolls are as wide as the typical distance between joists and are made so you can simply set them into place. Compared to other insulation methods, fiberglass bats are very inexpensive. Because they are cut to the standard width between joists, they are very easy to install. You can do it yourself without any tools besides a razor blade to cut it to length. Insulation is rated by the material’s thermal resistance or R-value. Fiberglass batts have a high R rating for the price—typically 3.0-4.0 per inch. To get the best attic insulation, there should not be any space left bare. Because fiberglass batts are usually just shoved into place, there may be exposed areas. These exposed areas can occur because the edges weren’t cut to the exact right size or because of interference from wires, pipes, or ducts. Also, since fiberglass batts are usually cut to a standard size, they won’t fit houses with wider or narrower joists. Not to mention that fiberglass is an irritant. It’s easy enough to protect yourself during insulation, but fiberglass dust may enter your home’s ventilation system and cause health problems. Another popular method of is blown in, or loose fill, insulation. Using a hose, small particles of insulation are blown into the attic to fill the cover all the places heat might get through. This insulation is usually small bits of fiberglass or cellulose, which is made from recycled newspaper. As mentioned earlier, you don’t want your insulation to leave any areas unexposed. Blown in insulation offers a more thorough coverage than batts. Blown in attic insulation is more effective than batts even with full coverage. Millions of small air pockets between the particles of insulation slow down the transfer of heat, insulating your home. Blown in insulation is also quite affordable, and can let you save up to 17% on cooling costs. It is also long lasting. Our blown in insulation can last fifteen years with no maintenance at all. Because blown in insulation is loose, it might lose effectiveness at extreme temperatures if they aren’t covered with a fiberglass blanket. Per inch, it is not as effective as fiberglass batts. Blown in insulation typically has an R rating below 3.0, so you have to use more of it. But because it gets better coverage, the savings are comparable to batts. Also, the dangers of fiberglass dust are the same as with fiberglass batts. Spray foam insulation is a relatively new technology, but it has been gaining widespread popularity. A thin layer of foam is sprayed onto the exposed structure of the house. The foam then expands, achieving maximum coverage and filling small cracks and holes. This makes it a great choice for attic insulation. Spray foam insulation is incredibly effective—it boasts an R rating of 6.0 per inch. This can reduce energy consumption by an incredible 50%. Because it doesn’t have any harmful dust particles that can enter your home, spray foam insulation can improve the air quality in your home. The expanding foam offers complete coverage, even where they may be wires or pipes. For all of its effectiveness, it should come as no surprise that spray foam insulation is very expensive. It can cost three or four times more than fiberglass batts. While it will surely pay for itself over time, many people can’t afford the initial investment. 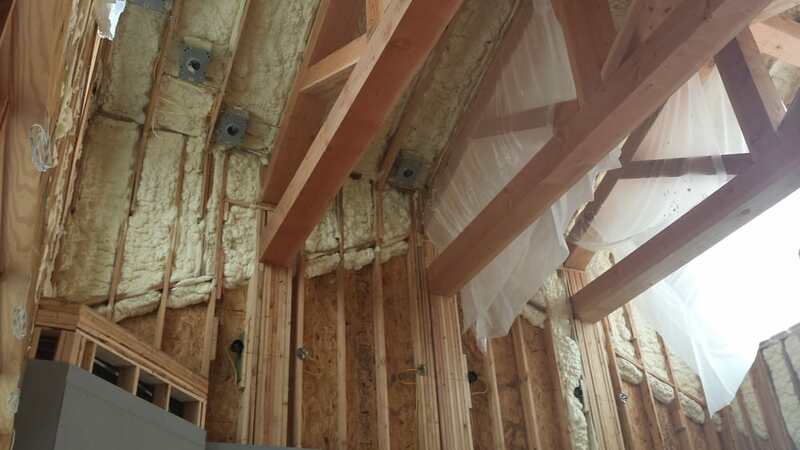 Spray foam insulation requires a professional installation, which adds to the cost. The chemicals used to make spray foam have raised environmental concerns. While the final state is safe, certain chemicals used may be hazardous to the environment. But since it helps save so much energy, that hazard may be negligible. If you are serious about protecting your attic from heat, you’re going to want to look into radiant barrier foil. A radiant barrier foil is a thin metal layer, usually aluminum, that is installed along the rafters in the attic. When the sun beats down on your house, your roof absorbs energy, and that energy is transferred into your attic. Even the most effective installation can only slow the transfer of heat down. Radiant barrier foil actually reflects that energy back into the sky. Radiant foil deflects up to 97% of heat. This can also help keep heating bills down in the winter time. As heat rises into the attic, the radiant barrier stops it from escaping. Radiant barrier foil is also easy to install. It requires no special tools or equipment, so installation costs are low. You will want to trust a professional with installation though. Just because Texas is hot, that doesn’t mean that your attic has to be. Proper attic insulation can drastically reduce the temperature in your attic. This keeps your entire house cool, which saves you sweat and money. If you’re stuck in a house with a poorly insulated attic, don’t worry. 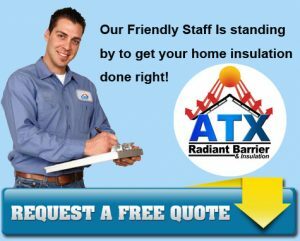 At ATX Radiant Barrier & Insulation, we’re proud to help our fellow Austin residents keep cool, save money, and use less energy.